To Cite: Nashibi R, Afzalzadeh S, Mohammadi M J, Yari A R, Yousefi F. Epidemiology and Treatment Outcome of Mucormycosis in Khuzestan, Southwest of Iran, Arch Clin Infect Dis. 2017 ; 12(1):e37221. doi: 10.5812/archcid.37221. Background: Mucormycosis is an uncommon life-threatening fungal infection. The major risk factors of this infection include uncontrolled diabetes mellitus, prolonged steroid therapy, persistent neutropenia, hematological malignancies, autoimmune disorders, trauma, burns and surgical wounds. Objectives: The current study aimed to determine the epidemiology and treatment outcome of mucormycosis in Khuzestan province, southwest of Iran. Methods: This cross-sectional study was performed during a period of 10 years from April 2004 to March 2014 at Razi hospital in Ahvaz, southwest of Iran, during years 2004 to 2014. Demographic data, laboratory data, clinical features, antifungal treatment, the need for surgical debridement and the outcome were collected. Data were summarized using descriptive statistical methods and analyzed by SPSS version 15 software. Results: The study included 20 patients with a biopsy-proven diagnosis of mucormycosis. Regarding the findings, the mean age was 51.4 ± 9.7 years. Eighty-five percent of patients had uncontrolled diabetes mellitus. Findings showed that all the cases received amphotericin B, but surgical debridement was performed on 10 patients (50%). Most prevalent season of mucormycosis was winter (40%). Conclusions: Prognosis of patients that underwent surgery and medical therapy was significantly better than medical therapy alone (90% vs. 50% patient’s survival). Mucormycosis is an uncommon life-threatening infection caused by fungi of class Zygomycetes, other Mucorales, and are ubiquitous fungi in the environment that are commonly found in decaying organic substrates, including bread, fruits, vegetables, soil, compost piles and animal excreta (1-4). The principle risk factors associated with mucormycosis include uncontrolled diabetes and diabetic ketoacidosis, prolonged steroid therapy, persistent neutropenia, deferoxamine therapy, hematological malignancies, illicit use of intravenous drugs, autoimmune disorders, prophylaxis with voriconazole or echinocandins, and cutaneous or mucous membrane barrier due to trauma, burns and surgical wounds. However, it has also been described in patients with no underlying disease (5-10). This infection is more common among people with suppressed immune systems, but it can rarely occur in people, who are otherwise healthy (11). The primary mode of acquisition of mucormycosis is inhalation of spores from environmental sources (12). Other modes of acquisition include the cutaneous route with traumatic disruption of skin barriers, burns or direct injection or catheters (13). Gastrointestinal mucormycosis, although less common, has been reported in immunosuppressed patients (14). The site of infection varies, and can occur in the lungs, the skin and soft tissue, the rhino-orbito-cerebral region and the gastrointestinal tract (15). A classic feature of mucormycosis is tissue necrosis, as a result of vascular invasion and subsequent thrombosis (16). The treatment strategy involves timely diagnosis and aggressive surgical debridement combined with high dose amphotericin B and reversal of underlying predisposing factors whenever possible (15, 17). The site of infection and underlying host factors are the key prognostic determinants of mucormycosis outcome. The mortality rate of patients, who received systemic antifungal therapy alone was 55% compared with 27% in patients, who received antifungal therapy plus surgical management (14). Knowing these features may increase the chance of an early diagnosis, which in turn may prevent aggressive tissue invasion, reduce the need for extensive surgical debridement and improve survival. The current study aimed to assess the demographic characteristics of mucormycosis, underlying conditions, the most prevalent season of involvement, and outcome of patients from Razi hospital in Ahvaz, southwest of Iran, during years 2004 and 2014. This cross-sectional study was performed at Razi teaching hospital, Ahvaz (principle referral center for infectious diseases in Khuzestan province). Location of the study was in the south west of Ahvaz city, Razi hospital, with approximately 220 beds, which is located between 48° and 49° 29’ east of the Greenwich meridian, 31°and 45’ minutes north of the equator (8, 18, 19). Data were collected during a period of 10 years from April 2004 to March 2014, including demographic information, underlying conditions, concomitant immunosuppressive medications, laboratory data, radiologic findings, clinical features, antifungal treatment, the need for surgical debridement and outcome. The patients included in the study had a proven diagnosis of mucormycosis by biopsy from suspected lesions and demonstration of broad, ribbon-like, wide-angled branching, and non-septate hyphae even in the absence of positive culture and tissue invasion by fungal hyphae. Patients with human immunodeficiency virus (HIV) infection were excluded from the study. All the patients were treated with deoxycholate amphotericin B, at a dose of 1 mg per kilogram body weight daily, that was administered over four to six hours after infusion of a test dose of 1 mg of the drug in 100 mL of normal saline. Data were analyzed using the SPSS version 15 software. P values were considered significant when P < 0.05. Means were compared using Fisher’s exact test. Twenty patients with biopsy-proven mucormycosis participated in the study. Thirteen patients (65%) were males and seven (35%) were females. The mean age was 51.4 ± 9.7 years (20 - 68 years) (Table 1). The most common underlying condition in these patients was uncontrolled diabetes mellitus that was reported in 17 cases (85%). Other conditions, each found in one case included trauma (5%), using glucocorticoids (5%) and dental extraction (5%). The most common site of involvement was the rhinocerebral region, occurring in six cases (30%). All patients received amphotericin B but surgical debridement was performed in 10 patients (50%) with complete excision of the infected area. The most common involved sinus was maxillary in nine cases (45%), and the most common affected cranial nerve was the third, occurring in 13 cases (65%). 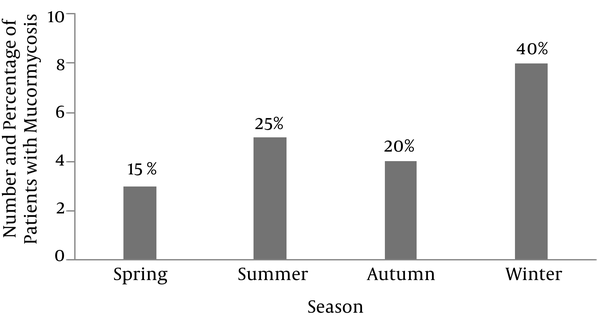 Also, as demonstrated in Figure 1, our study showed that the most prevalent season of mucormycosis was winter with eight cases (40%). Overall, 15 out of 20 patients (75%) were cured and five patients (25%) passed away, and one patient (5%) was complicated by blindness. Neither of the five patients who passed away underwent surgical debridement, while surgery was performed for ten out of 15 patients, who survived. Fifty percent of patients treated with amphotericin B alone, survived. We performed Fisher’s exact test for evaluation of the relationship between surgery and reduced mortality and found a significant association (P = 0.033). Mucormycosis is a rare life-threatening infection, which may lead to high mortality and this infection mostly afflicts immune-compromised or severely hyperglycemic patients (14). In this study, mucormycosis was more prevalent in males than in females (65% vs. 35%). This finding was similar to the results of a large review by Roden et al. in 2005, which reported that male gender constituted 65% of the cases (16). Also Mohinisingh in 2015 (20) and Sachdeva in India (21) reported results similar to our findings. In our study, the median age of patients was 51 years that is slightly lower than the study performed by Saegeman et al. in Belgium with a mean age of 60 years (22). In this study, uncontrolled diabetes mellitus was the most common risk factor for mucormycosis (85%). This finding was in accordance with the results obtained by Mohinisingh in 2015 (85.7%) (20), Khor et al. in Taiwan (95%) (23), and Barati et al. in Tehran (60%) (24). However, in some studies, hematologic and non-hematologic malignancies were reported as the most common underlying predisposing factor (10, 25). In general, the mechanism responsible for the increased susceptibility to mucormycosis is immunodeficiency. In mucormycosis, the infection mostly develops after inhalation of fungal spores into the paranasal sinuses and then may rapidly progress to adjacent tissues and spread inferiorly to the palate, posteriorly to the sphenoid sinus, laterally into the cavernous sinus to involve the orbits, or cranially to invade the brain (26). In our patients, the most common type of mucormycosis was rhino cerebral, the reason of which was not clear. Studies carried out by Hong et al., Sarvestani et al., Petrikkos et al. and Komur et al. also showed similar results (10, 14, 26, 27). In contrast, studies conducted by Saegeman et al. in Belgium and pagano et al. in Italy, demonstrated that pulmonary mucormycosis was the most common type of infection, probably because in both studies most of the patients had hematological malignancies (22, 28). Our study displayed that winter was the most common season for the occurrence of mucormycosis; similarly, the study performed in Athens by Bartzokas, showed that during autumn and winter, the number of mucormycosis was twice as high as in spring and summer (29). Since the weather in our region, Khuzestan, is somewhat similar to that of autumn in other countries in the Middle East, the minor differences in the most frequent time of the year could be justified. Also, a previous study conducted by EI-Herte et al. suggested that mucormycosis has a seasonal variation, and a positive correlation with humidity and a negative correlation with temperature (30). Prognosis of patients that underwent surgery in addition to medical therapy was significantly better than those with medical therapy alone (90% vs. 50% survival rate; P = 0.033). pagano et al. and Chakrabarti et al. also obtained results similar to our findings (28, 31). The limitation of this study was its small sample size because of the rarity of this invasive fungal infection, so we propose more studies with larger sample sizes to be performed in the future. There were some limitations in the current study such as small sample size. Based on our findings, it seems that the outcome of patients managed with a combination of surgery and medical therapy could be better than patients receiving medical therapy alone. Also, seasonal variations appear to affect the prevalence of the disease. The authors would like to thank the student research committee, Ahvaz Jundishapur University of Medical Sciences for providing financial supported by grant 94s160. Conflicts of Interest: The authors had no conflicts of interest. Funding/Support: This work was financially supported by grant number 94s160, from the vice-chancellor for research Affairs of Ahvaz Jundishapur University of Medical Sciences.